In an unparalleled collaboration, two leading global thinkers in technology and foreign affairs give us their widely anticipated, transformational vision of the future: a world where everyone is connected?a world full of challenges and benefits that are ours to meet and harness. Eric Schmidt is one of Silicon Valley's great leaders, having taken Google from a small startup to one of the world's most influential companies. Jared Cohen is the director of Google Ideas and a former adviser to secretaries of state Condoleezza Rice and Hillary Clinton. With their combined knowledge and experiences, the authors are uniquely positioned to take on some of the toughest questions about our future: Who will be more powerful in the future, the citizen or the state? Will technology make terrorism easier or harder to carry out? What is the relationship between privacy and security, and how much will we have to give up to be part of the new digital age? In this groundbreaking audiobook, Schmidt and Cohen combine observation and insight to outline the promise and peril awaiting us in the coming decades. At once pragmatic and inspirational, this is a forward-thinking account of where our world is headed and what this means for people, states and businesses. With the confidence and clarity of visionaries, Schmidt and Cohen illustrate just how much we have to look forward to?and beware of?as the greatest information and technology revolution in human history continues to evolve. On individual, community and state levels, across every geographical and socioeconomic spectrum, they reveal the dramatic developments?good and bad?that will transform both our everyday lives and our understanding of self and society, as technology advances and our virtual identities become more and more fundamentally real. As Schmidt and Cohen's nuanced vision of the near future unfolds, an urban professional takes his driverless car to work, attends meetings via hologram and dispenses housekeeping robots by voice; a Congolese fisherwoman uses her smart phone to monitor market demand and coordinate sales (saving on costly refrigeration and preventing overfishing); the potential arises for ?virtual statehood? and ?Internet asylum? to liberate political dissidents and oppressed minorities, but also for tech-savvy autocracies (and perhaps democracies) to exploit their citizens? mobile devices for ever more ubiquitous surveillance. Along the way, we meet a cadre of international figures?including Julian Assange?who explain their own visions of our technology-saturated future. 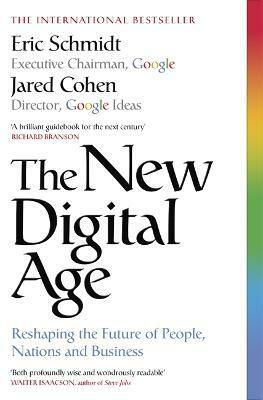 Inspiring, provocative and absorbing, "The New Digital Age" is a brilliant analysis of how our hyper-connected world will soon look, from two of our most prescient and informed public thinkers.